Upper Body Weight Training Exercises to Build Muscle. Workouts, best exercises and routines. Build wide shoulders, broad chest and back muscles to look bigger and fuller. Building a great Upper Body is everyone's dream. Thick, broad shoulders and puffed up chest is the look what a Bodybuilder craves for. Upper body Muscles include Deltoids, Chest Shoulders and Arms. 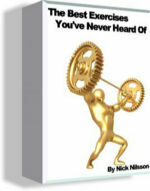 Here I will show you the best Muscle Builders for your upper Body and workout plans to build them beyond imagination. There are 2 basic Shoulder Exercises - Straight Arm Raises and Presses. These 2 are the primary functions of the shoulder muscles. Basic Deltoid Muscle Builders -Shoulder Military Press and Dumbbell Lateral Raises. Additional Exercises for entire shoulder girth and thickness - Upright Rows, Bent over Lateral Raises and Front Raises. There are 2 basic Chest Muscle Builders -Chest Press and Dumbbell Flyes. Additional Exercises for overall chest development - Incline Bench Press, Decline Bench Press, Pullovers and Machine Flyes. 3 movements are specific for back as it is divided in to Upper, middle and Lower back. Lower Back - The good ol'Deadlifts. Additional Back Exercises for overall thickness and fine tuning -Lat Pull downs,T bar Rows orSeated Rows,Hyperextensions and Good Mornings. Additional Arm Builders -Dumbbell Curls, Hammer Curls, Kickbacks,Dips and Reverse Wrist Curls. Click here for Best Upper Body Weight Training Workouts.